In recent years, the number of extra-solar planets discovered around nearby M-type (red dwarf stars) has grown considerably. In many cases, these confirmed planets have been “Earth-like“, meaning that they are terrestrial (aka. rocky) and comparable in size to Earth. These finds have been especially exciting since red dwarf stars are the most common in the Universe – accounting for 85% of stars in the Milky Way alone. Unfortunately, numerous studies have been conducted of late that indicate that these planets may not have the necessary conditions to support life. The latest comes from Harvard University, where postdoctoral researcher Manasvi Lingam and Professor Abraham Loeb demonstrate that planets around M-type stars may not get enough radiation from their stars for photosynthesis to occur. Finding potentially habitable planets beyond our Solar System is no easy task. While the number of confirmed extra-solar planets has grown by leaps and bounds in recent decades (3791 and counting! ), the vast majority have been detected using indirect methods. This means that characterizing the atmospheres and surface conditions of these planets has been a matter of estimates and educated guesses. Similarly, scientists look for conditions that are similar to what exists here on Earth, since Earth is the only planet we know of that supports life. But as many scientists have indicated, Earth’s conditions has changed dramatically over time. And in a recent study, a pair of researchers argue that a simpler form of photosynthetic life forms may predate those that relies on chlorophyll – which could have drastic implications in the hunt for habitable exoplanets. In of August of 2016, astronomers from the European Southern Observatory (ESO) confirmed the existence of an Earth-like planet around Proxima Centauri – the closest star to our Solar System. In addition, they confirmed that this planet (Proxima b) orbited within its star’s habitable zone. Since that time, multiple studies have been conducted to determine if Proxima b could in fact be habitable. Unfortunately, most of this research has not been very encouraging. For instance, many studies have indicated that Proxima b’s sun experiences too much flare activity for the planet to sustain an atmosphere and liquid water on its surface. However, in a new NASA-led study, a team of scientists has investigated various climate scenarios that indicate that Proxima b could still have enough water to support life. In February of 2017, the world was astounded to learn that astronomers – using data from the TRAPPIST telescope in Chile and the Spitzer Space Telescope – had identified a system of seven rocky exoplanets in the TRAPPIST-1 system. As if this wasn’t encouraging enough for exoplanet-enthusiasts, it was also indicated that three of the seven planets orbited within the stars’ circumstellar habitable zone (aka. “Goldilocks Zone”). Since that time, this system has been the focus of considerable research and follow-up surveys to determine whether or not any of its planets could be habitable. Intrinsic to these studies has been the question whether or not the planets have liquid water on their surfaces. 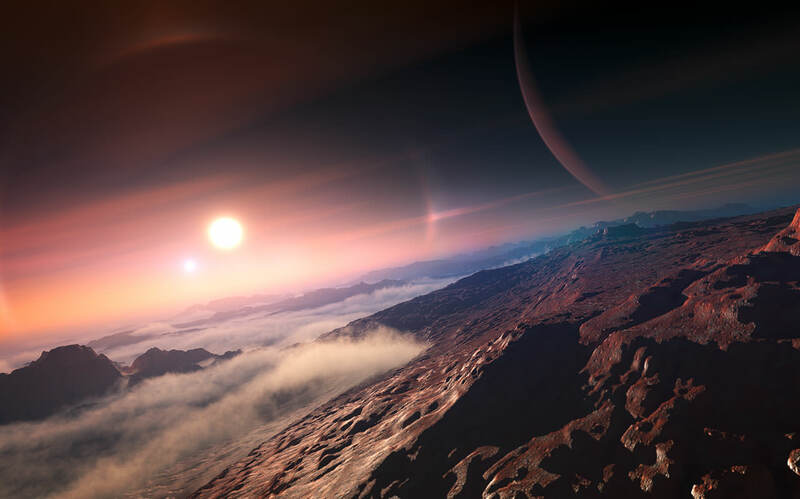 But according to a new study by a team of American astronomers, the TRAPPIST planets may actually have too much water to support life. The study, titled “Inward Migration of the TRAPPIST-1 Planets as Inferred From Their Water-Rich Compositions“, recently appeared in the journal Nature Astronomy. The study was led by Cayman T. Unterborn, a geologist with the School of Earth and Space Exploration (SESE), and included Steven J. Desch, Alejandro Lorenzo (also from the SESE) and Natalie R. Hinkel – an astrophysicists from Vanderbilt University, Nashville. As noted, multiple studies have been conducted that have sought to determine if any of the TRAPPIST-1 planets could be habitable. And while some have stressed that they would not be able to hold onto their atmospheres for long due to the fact that they orbit a star that is variable and prone to flaring (like all red dwarfs), others studies have found evidence that the system could be rich in water and ideal for life-swapping. For the sake of their study, the team used data from prior surveys that attempted to place constraints on the mass and diameter of the TRAPPIST-1 planets in order to calculate their densities. Much of this came from a dataset called the Hypatia Catalog (developed by contributing author Hinkel), which merges data from over 150 literary sources to determine the stellar abundances of stars near to our Sun. Using this data, the team constructed mass-radius-composition models to determine the volatile contents of each of the TRAPPIST-1 planets. What they noticed is that the TRAPPIST planets are traditionally light for rocky bodies, indicating a high content of volatile elements (such as water). On similarly low-density worlds, the volatile component is usually thought to take the form of atmospheric gases. Because of this, Unterborn and his colleagues determined that the low-density component in this planetary system had to be water. To determine just how much water was there, the team used a unique software package developed known as ExoPlex. This software uses state-of-the-art mineral physics calculators that allowed the team to combine all of the available information about the TRAPPIST-1 system – not just the mass and radius of individual planets. These findings do not bode well for those who believe that M-type stars are the most likely place to have habitable planets in our galaxy. Not only are red dwarfs the most common type of star in the Universe, accounting for 75% of stars in the Milky Way Galaxy alone, several that are relatively close to our Solar System have been found to have one or more rocky planets orbiting them. Aside from TRAPPIST-1, these include the super-Earths discovered around LHS 1140 and GJ 625, the three rocky planets discovered around Gliese 667, and Proxima b – the closest exoplanet to our Solar System. In addition, a survey conducted using the HARPS spectrograph at the ESO’s La Silla Observatory in 2012 indicated that there could be billions of rocky planets orbiting within the habitable zones of red dwarf stars in the Milky Way. Unfortunately, these latest findings indicate that the planets of the TRAPPIST-1 system are not favorable for life. What’s more, there would probably not be enough life on them to produce biosignatures that would be observable in their atmospheres. In addition, the team also concluded that the TRAPPIST-1 planets must have formed father away from their star and migrated inward over time. This was based on the fact that the ice-rich TRAPPIST-1 planets were far closer to their star’s respective “ice line” than the drier ones. In any solar system, planets that lie within this line will be rockier since their water will vaporize, or condense to form oceans on their surfaces (if a sufficient atmosphere is present). Beyond this line, water will take the form of ice and can be accreted to form planets. From their analyses, the team determined that the TRAPPIST-1 planets must have formed beyond the ice line and migrated towards their host star to assume their current orbits. However, since M-type (red dwarf) stars are known to be brightest after the first form and dim over time, the ice line would have also moved inward. As co-author Steven Desch explained, how far the planets migrated would therefore depend on when they had formed. “The earlier the planets formed, the farther away from the star they needed to have formed to have so much ice,” he said. Based on how long it takes for rocky planets to form, the team estimated that the planets must have originally been twice as far from their star as they are now. While there are other indications that the planets in this system migrated over time, this study is the first to quantify the migration and use composition data to show it. This study is not the first to indicate that planets orbiting red dwarf stars may in fact be “water worlds“, which would mean that rocky planets with continents on their surfaces are a relatively rare thing. At the same time, other studies have been conducted that indicate that such planets are likely to have a hard time holding onto their atmospheres, indicating that they would not remain water worlds for very long. However, until we can get a better look at these planets – which will be possible with the deployment of next-generation instruments (like the James Webb Space Telescope) – we will be forced to theorize about what we don’t know based what we do. By slowly learning more about these and other exoplanets, our ability to determine where we should be looking for life beyond our Solar System will be refined.